Manufacturers of medical devices use laser marking on medical devices because of the mark clarity, permanency (no added paints or chemicals), and its ability to survive repeated sterilization. The medical engraving process is approved by the FDA, so instrument manufacturers have one less hurdle in the product approval process. The medical engraving process can produce a dark, smooth mark on most metal surfaces so the laser marking does not trap blood or tissue material and thus simplifies cleaning and sterilization. 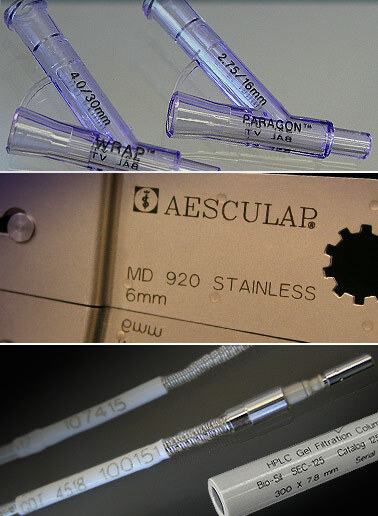 Delrin, Teflon, PEEK, and ABS are examples of medical plastics that are commonly marked by the laser plastics engraving process. Laser Impressions Inc. processes and procedures are structured under ISO 9001:2008 and ISO 13485:2003 to ensure quality and repeatability for your laser marking and laser engraving requirements.